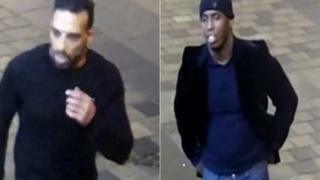 Detectives have released images of two men they want to question about a serious assault in Glasgow. The victim was attacked at about 01:30 on Saturday 25 August in Sauchiehall Lane near Blythswood Street. One of the men police want to trace is black and in his early to mid 20s, the second is described as Asian, in his late 20s to early 30s. In a separate incident, police have released images of a man they want to quiz about an attack nearby in March. The victim in the most recent assault was taken to Glasgow Royal Infirmary for treatment to a head injury and later released. The black man was wearing a black beanie style hat, black jacket, blue T-shirt, blue jeans and black shoes. The second man had short black hair and a short beard and was wearing a black jumper, dark blue denim jeans and black shoes. Det Con Kevin Parkin said: "A man has been left in a state of shock after being assaulted whilst on a night out. "Sauchiehall Lane was busy with revellers at the time of the incident and I'm appealing for anyone who may have seen either of the men in the images, or knows who they are, to get in touch as it is vital that they are spoken to as part of the investigation." In the earlier incident, the 19 year-old victim needed hospital treatment after he was attacked on Sauchiehall Street at about 03:30 on Friday 16 March. The man being sought is in his early 20s and was wearing a black T-shirt with "Vans Off The Wall" emblazoned on the back. Det Con John Fagan said it appeared to have been a motiveless attack. He said: "This was a violent and unprovoked assault on a young man enjoying a night out in Glasgow. Police are also appealing for witnesses after a 42-year-old man was found unconscious in the city's Cadogan Street at about 21:15 on Sunday. Officers say the man who is being treated in hospital for facial injuries was attacked by another man shortly before he was found. The suspect is white, tall, of skinny build, with dark hair and stubble. He was wearing a grey jumper.